How do I add donation levels to my campaign? Click "You" on the top right corner of your page on GiveGab and from the drop down menu, select "Admin Dashboard" for the organization you'd like to access. From the Overview Tab of your Admin Dashboard click on the "Campaigns" box in the center of the top row. You can also expand the "Fundraising" tab on the left hand side of your dashboard and select "Campaigns" from the drop down menu. Once you have navigated to the campaigns page, click "Edit" on the campaign you'd like to work on. From your campaign editor, click the "Donation Levels" Tab from your left navigation. To start creating your donation levels click the "Add Donation Level" button to begin customizing your campaign's donation levels. 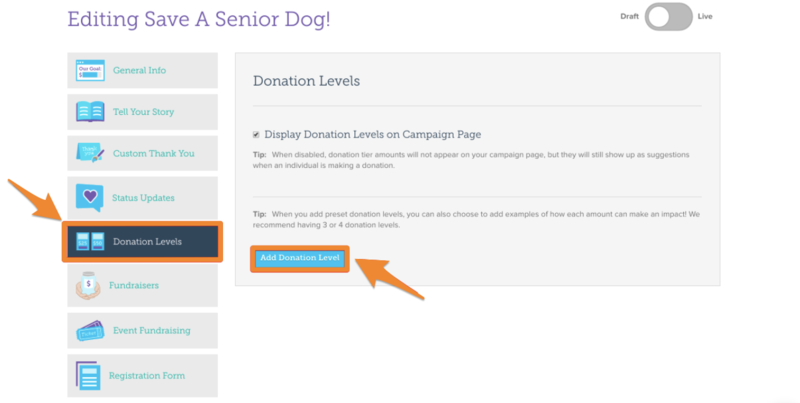 From the Donation Levels Tab of your Campaign Editor, you can customize your giving levels by adding an amount, description, and even an image! Once you've added your customizations click the "Save" button. To continue adding additional levels click the "Add Donation Level" button as many times as you'd like - though we typically recommend between 3-5 giving levels for your campaign. Once you've finished customizing your donation levels, click "View" from the toolbar at the bottom of your page to preview your campaign. Only organizations that are verified to accept donations on GiveGab will be able to preview their giving levels.